Butterworth, Chebyshev, Bessel and Elliptic filters. There are basically 4 types of activeÂ filters. They are butterworth, Chebyshev, Bessel and Elliptic filters. This filter is also called as maximally flat or flat flat filter. This class of filters approximates the ideal filter well in the pass band. 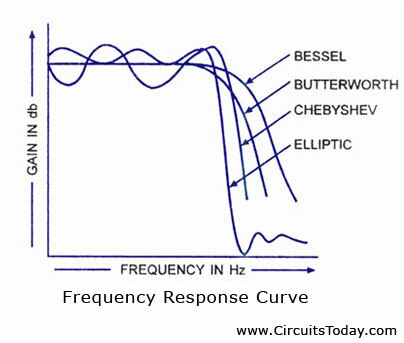 Frequency responseÂ curves of different types of filters are shown in figure. The Butterworth filter has an essentially flat amplitude-freÂ­quency response upto the cutÂ­off frequency. The sharpness of the cut-off can be seen in the figure. It is to be noted that all the three filters reach a roll-off slope of -40 db/decade at frequencies much larger than cut-off. Although Butterworth filters achieve the sharpest attenuation, their phase-shift as a function of frequency is non-linear. It has a monotonic drop in gain with frequency in the cut-off region and a maximally flat response below cut-off frequency, as ilÂ­lustrated in figure. 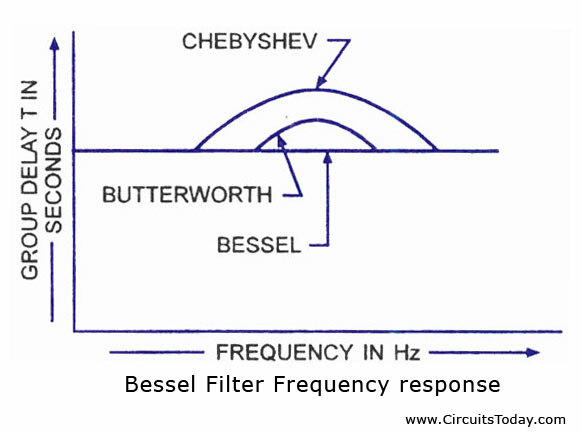 TheÂ Butterworth filter has characteristic somewhere beÂ­tween those of Chebyshev and Bessel filters. It has a moderate roll-off of the skirt and a slightly nonÂ­linear phase responses. It is also called a equal ripÂ­ple filter. It gives a sharper cut-off than Butterworth filter in the passband. 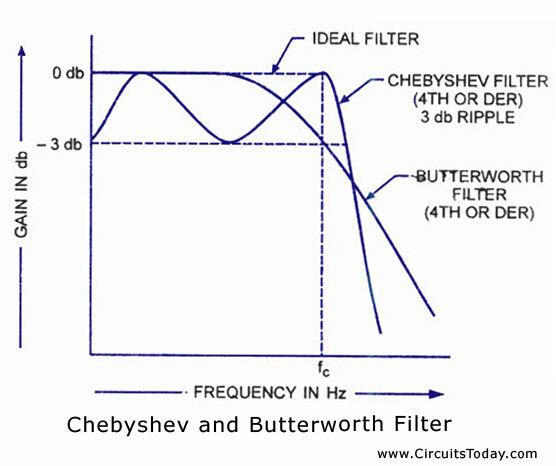 Both Butterworth and Chebyshev filters exhibit large phase shifts near the cut-off frequency. A drawback of the Chebyshev filÂ­ter is the appearance of gain maxima and minima below the cut-off frequency. This gain ripple, exÂ­pressed in db, is an adjustable parameter in filter design. The faster the roll-off, the greater the peak-to-peak ripples in the passband. The phase response is highly non-linear in the skirt region. Such unequal delays of data frequency in the passband causes severe pulse distorÂ­tion and thus increased errors at modern demodulators. This can be overcome someÂ­what by increasing the BW of the filter so that the phase region is extended.A Chebyshev filter is used where very sharp roll-off is required. However, this is achieved at the expense of a gain ripple in the lower frequency passband. The Bessel filter provides ideal phase characteristics with an approximately linear phase reÂ­sponse upto nearly cut-off frequency. Though it has a very linear phase response but a fairly gentle skirt slope, as shown in figure.For applications where the phase characteristic is important, the Bessel filter is used. It is a minimal phase shift filter even though its cut-off characteristics are not very sharp. It is well suited for pulse applicaÂ­tions. This filter has the sharpest roll-off of all filters in the transition regionÂ but has ripples in both the pass band and stop band regions, as illustrated in figure. TheÂ elliptic filter can be designed to have very high attenuation for certain frequencies in theÂ stop band, which reduces the attenuation for other frequencies in the stop band.